Contouring is an imaginary line on the ground obtained by joining points having same elevation. Contour lines are closed, however they may be close on the map itself or outside the map depending upon the topography. 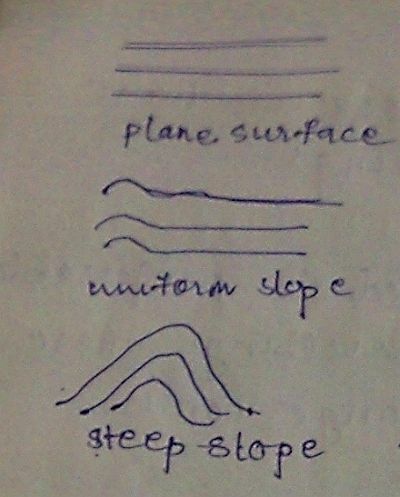 The spacing between contour lines depends upon the slope of the ground. In steep slopes, the spacing is small, for gentle slopes the spacing is large. If the contour lines are equally spaced, they indicate uniform slope. If the contour lines are parallel, straight or equally placed, they represent plane surface. In a series of contour lines on the plan or map indicates either a hill or depression. 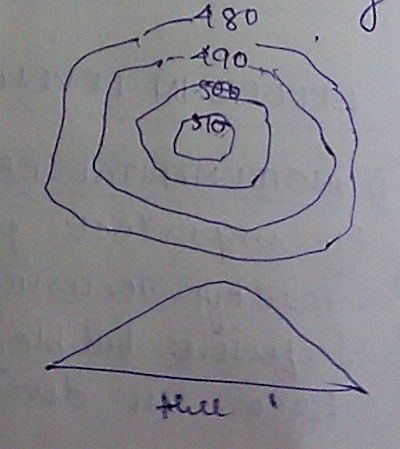 In case of the hill, the values of the elevation go on increasing towards the centre whereas in case of depression, the values go on decreasing towards the centre.